The Feeding Cup is a small vessel , with a spout rising from near its base, for feeding milk and other liquids to the patients having certain medical conditions. 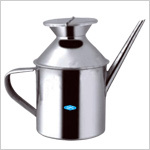 GPC Medical Limited, leading Indian manufacturers & exporters of a vast range of hospital equipment, devices & instruments, produce a variety of high class stainless steel hospital hollowware including Feeding Cups also. These cups, neither too big nor heavy, are designed in such a way as the user has an easy grip to drink the liquid. In addition to our standard Cups, customised requirements of size/dimensions are also met. Food grade stainless steel, of very superior quality, as per the international standards, is used for their production. They are easy to clean. They are highly durable. The GPC Stainless Steel Feeding Cups are regularly exported to many different countries across the globe. Send Your Buy Requirement For "Feeding Cup" AND Get Quote Quickly.